Unbelievable! These Rare Sharks Live In An Underwater Volcano. - 2NGAW! Unbelievable! These Rare Sharks Live In An Underwater Volcano. It’s a discovery that truly startled a team of researchers studying underwater volcanoes at Solomon Islands. Huffington Post reported that Brennan Phillips and his crew dropped a camera around 12 miles from Kavachi, a nearby underwater volcano, to find out what lies underneath. Much to their surprise, something unexpectedly popped up while they were taking footages. At first, they couldn’t figure out what the blob-like creature was but as they zoomed in and adjusted the light settings, they came to a conclusion that it was indeed a type of shark – and a rare one at that. Through its distinct physical creature and color, the underwater being was confirmed to be a Pacific sleeper shark. Sleeper sharks are usually found in Pacific and Atlantic Oceans that’s why it’s a bit puzzling why this team of scientists discovered the creature in their location. “We were freaking out,” Brennan said during his interview with the National Geographic. “The idea of there being large animals like sharks, hanging out and living inside the caldera of this volcano conflicts with what we know about Kavachi,” he added. Besides, the active volcano is extremely hot and very acidic. By nature, sleeper sharks can grow up to 7 meters long. They can swim without noise and with only minor movement, making it easy for this predator to catch preys. As far as Brennan’s team is concerned, they know of only 2 other instances when a sleeper shark has been caught on camera. According to them, this is the only instance when the creature has been filmed in high definition. So to reemphasize, yes, this type of shark couldn’t be harmed even by an active underwater volcano. That sounds pretty scary, right? Scary and alarming! 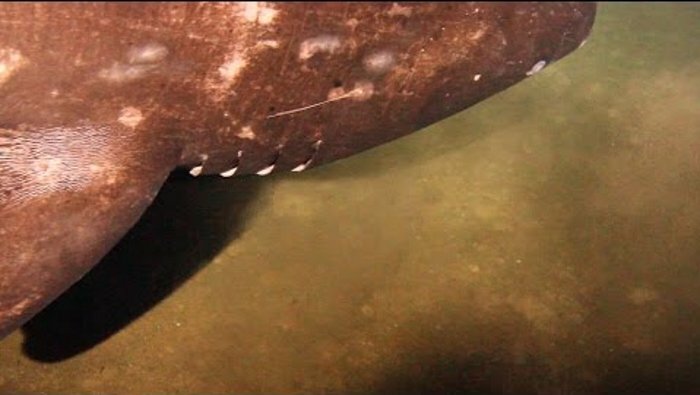 Go watch the video below and see the sleeper shark for yourself. Also, feel free to share this on your social media account.